Hello everyone my name is Leko, and I am a consistently legend player. In this guide, I was interested in the cards of the new expansion ( Rise of the Shadows ) that support the secret paladin archetype. I have to mention here that in April 2018, when bellringer sentry was introduced in Witchwood, I managed ti get into top 50 with secret paladin. Later this deck was outclassed from odd paladin, who was the dominant archetype of aggro paladin at the time. As a mid range deck, you are always looking to get ahead at early or stall till your powerspike at the mid game with Bellringer Sentry and buffed dragons. You can keep Secretkeeper Sunreaver Spy Mysterious Blade along with a secret for a strong opening against every matchup but you are definitely not keeping a secret and look for them. Cathedral Gargoyle is also a considerable keep with a dragon in hand in the best case Bronze Herald . Against slower decks you keep Bellringer Sentry for strong lead at turn 4. 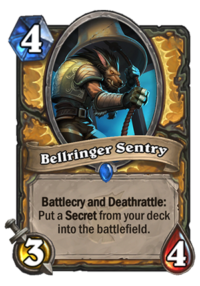 In the early game, you are looking to get the control of the board as soon as possible trading and developing at the same time till turn 4 where you drop Bellringer Sentry. A dream opening can be turn 1 secret, turn 2 Sunreaver Spy, turn 3 Masked Contender for the second secret straight outta deck and turn 4 bellringer “close the gates!”. Another opening of the sweet dreams is turn 1 secret into turn 2 Cathedral Gargoyle, turn 3 Masked Contender turn 4 Quasimodo. As we can see, a crucial point of the game is turn 4 bellringer and most of the time is the “finishing move” for the win. The mid game is the phase you should be already in control of the board and pressure for lethal. There will be occasions that you will not be at the “high ground” so you have to get the board using the removal tools Mysterious Blade Truesilver Champion, Dragonmaw Scorcher, Crowd Roaster and setting up huge minions with Dragon Speaker and Bronze Herald tokens combo. Mid game should be the last you should see with this deck so you must have figured out a way to get enemy hero to 0 health. Commander Rhyssa and Never Surrender! give your minions a total of +4 health each, tanking strong removal that deals damage to clear the board. At this phase of the game, we reached our powerspike so we continue from this point. We are looking for big buffed dragons thanks to Dragon Speaker, end game moves and thats it! Unfortunately, we lack strong late game threats and slow decks celebrate the stalling done for 15 turns and start dominating. The strategy against a slow deck is not to go late staying behind. A variety of cards can be teched either to cover a weakness against a desired matchup or to support the weak late game. Since its a theorycrafting deck the techs you can look into are Silence, weapon removal,specific minion type removal, board clear, Strong late game bodybuilders. Thank you very much for going through the guide of Mid range Secret Dragon Paladin,I hope you enjoyed and got the urge to try something in the new expansion. Rise of Shadows was released in April 9th 2019 and it was the first expansion of the year of Dragon with 2 more following during it.